Cory Parish has been entrusted with the ride on Muraaqeb for Lindsay Park in the Group One Toorak Handicap at Caulfield. Jockey Cory Parish is hoping his latest attempt at a Group One victory at Caulfield can replicate his win in one of Australia's biggest races. Parish won the 2017 Caulfield Cup following a rails hugging ride on the Lindsay Park-trained Boom Time and on Saturday he rides Muraaqeb for the stable in the Toorak Handicap at Caulfield. Boom Time has been Parish's sole Group One win and afforded him the opportunity of a ride in the Melbourne Cup and a trip to the Japan Cup. "They can't take the Caulfield Cup win off me," Parish said. "There's lots of jockeys who say they haven't ridden in it, let alone won it, so if I didn't ride in the Caulfield Cup again, I'm not going to lose any sleep. "I even managed to ride in the Melbourne Cup and I'd love to ride in it again, but it's such a hard caper. You just do your best every year and hope for the opportunity." Parish plans to give Muraaqeb another rails-hugging ride from his inside draw and believes the four-year-old has improved off his last start fifth in the Epsom Handicap at Randwick last month. "I rode him in the Epsom and he drew barrier two," Parish said. "He got a beautiful run in that race and hopefully again we can do the same. "I thought he hit a bit of a flat spot in the Epsom around 200 metres out but in the last 100 metres when I could get at him again he really came on. "That's what I really liked, he was doing his best work late and hopefully he can do the same again on Saturday." Parish has only two rides on Saturday and partners Pilote D'essai in the Herbert Power Stakes. Victory would gain the Lindsay Park-trained stayer a ballot exemption into the Caulfield Cup. It could also give Parish another shot at the big race. "He's got to win on Saturday to get a run," Parish said. 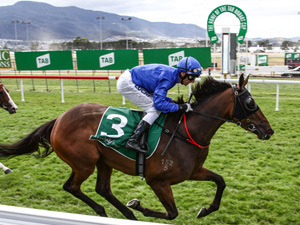 "I thought his run in the Benalla Cup was pretty good but he peaked on the run and his work since has been good."